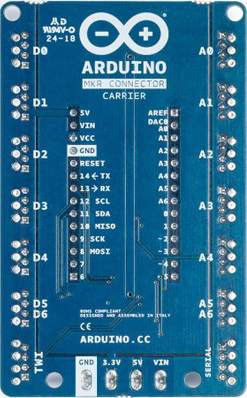 The MKR Connector Carrier allows any MKR board to use the range of modules and devices that use the Grove Connector, developer by Seeed Studio and now a de facto standard for solderless connection of analog and digital modules. PLEASE NOTE: a limited number of boards have a wrong labeling on the solder side. Please refer to the current image for the correct labelling. The component side labels are correct on all the boards. Please refer to them for your connections. All the I/Os are supplied at 5V and the carrier provides the proper 5V to 3.3V level shifting. The board has a buck converter that can be supplied with an external voltage from 7V to 16V connected to the VIN of the screw terminal block. The buck converter supplies the MKR board that provides the 5V and the 3.3V output that can also be found on the screw terminal blocks. Input only (analog or digital) with a maximum allowed voltage of 5V. The 5V to supplied the sensor is provided by the board. The last connector labeled A5 A6 is a connector that wires two analog inputs into a single connector according to the grove connector specifications. If a single input has to be used the wired one is A5. I/O digital with a maximum allowed voltage of 5V. The 5V to supplied the sensor is provided by the board. The last connector labeled D5 D6 is a connector that wires two digital I/O into a single connector according to the grove connector specifications. If a single I/O has to be used the wired one is D5. 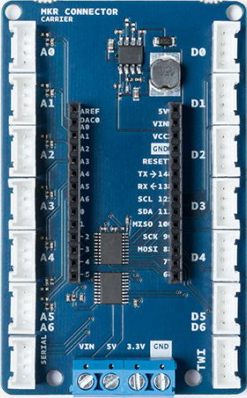 The Serial connector on the board is wired to the MKR board according to the grove connector specifications. The Grove UART module is a specialized version of a Grove Digital Module. It uses both Pin 1 and Pin 2 for the serial input and transmit. The Grove UART plug is labeled from the base unit point of view. In other words, Pin 1 is the RX line (which the base unit uses to receive data, so it is an input) where Pin 2 is the TX line (which the base unit uses to transmit data to the Grove module). The TWI connector on the board is wired to the MKR board according to the grove connector specifications. There are many types of I2C Grove sensors available. Most are 5V/3.3V devices, but there are a few that are only 3.3V or 5.0V. You need to check the specifications. Last revision 2018/08/08 by SM The text of the Arduino getting started guide is licensed under a Creative Commons Attribution-ShareAlike 3.0 License. Code samples in the guide are released into the public domain.